Get Onyx organized. 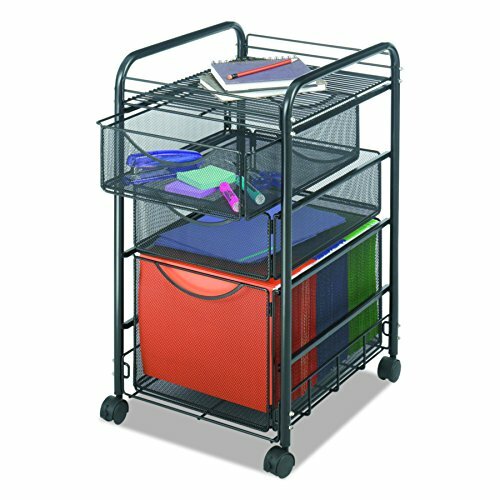 Contemporary style meets distinctive durability to create practical organization in this mesh cart. The tubular steel frame cart features two letter size file drawers 12"W x 16 1/2"D (ID) to keep hanging files easily accessible and in order. The top shelf 13 3/4"W x 16 1/8"D can store additional filing supplies, etc. Additional lower collapsible letter size file bin. When extra space is needed, easily store the 27"H cart under your desk or work surface. Collapsible drawer design for easy assembly. Steel construction with durable powder coat finish. Mobile on four 1 1/2" swivel casters, 2 locking.